A couple of weeks ago, I used a story about a local tax issue in Washington, DC, to make an important point about how new tax increases cause more damage than previous tax increases because “deadweight losses” increase geometrically rather than arithmetically. Simply stated, if a tax of X does Y amount of damage, then a tax of 2X will do a lot more damage than 2Y. This is the core economic reason why even left-leaning international bureaucracies agree that class-warfare taxes are so destructive. When you take a high tax rate and make it even higher, the damage grows exponentially. As such, I was very interested to see a new study on this topic from the World Bank. It starts by noting that higher tax rates are the wrong way to address fiscal shortfalls. …studies have used the narrative approach for individual or multi-country analyses (in all cases, focusing solely on industrial economies, and mostly on industrial European countries). These studies find large negative tax multipliers, ranging between 2 and 5. This recent consensus pointing to large negative tax multipliers, especially in industrial European countries, naturally entails important policy prescriptions. For example, as part of a more comprehensive series of papers focusing on spending and tax multipliers, Alesina, Favero, and Giavazzi (2015) point that policies based upon spending cuts are much less costly in terms of short run output losses than tax based adjustments. The four authors used data on value-added taxes to investigate whether higher tax rates did more damage or less damage in developing nations. A natural question is whether large negative tax multipliers are a robust empirical regularity… In order to answer this highly relevant academic and policy question, one would ideally need to conduct a study using a more global sample including industrial and, particularly, developing countries. …This paper takes on this challenge by focusing on 51 countries (21 industrial and 30 developing) for the period 1970-2014. …we focus our efforts on building a new series for quarterly standard value-added tax rates (henceforth VAT rates). …We identify a total of 96 VAT rate changes in 35 countries (18 industrial and 17 developing). The economists found that VAT increases did the most damage in developing nations. …when splitting the sample into industrial European economies and the rest of countries, we find tax multipliers of 3:6 and 1:2, respectively. While the tax multiplier in industrial European economies is quite negative and statistically significant (in line with recent studies), it is about 3 times smaller (in absolute value) and borderline statistically significant for the rest of countries. Here’s a chart showing the comparison. Now here’s the part that merits close attention. The study confirms that the deadweight loss of VAT hikes is higher in developed nations because the initial tax burden is higher. Based on different types of macroeconomic models (which in turn rely on different mechanisms), the output effect of tax changes is expected to be small at low initial levels of taxation but exponentially larger when initial tax levels are high. Therefore, the distortions and disincentives imposed by taxation on economic activity are directly, and non-linearly, related to the level of tax rates. 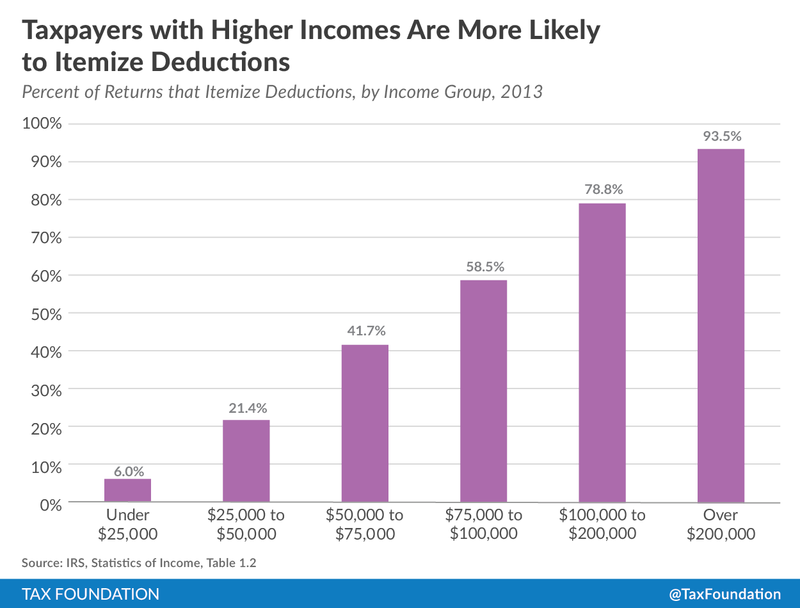 By the same token, for a given level of initial tax rates, larger tax rate changes have larger tax multipliers. …In line with theoretical distortionary and disincentive-based arguments, we find, using our novel worldwide narrative, that the effect of tax changes on output is indeed highly non-linear. Our empirical findings show that the tax multiplier is essentially zero under relatively low/moderate initial tax rate levels and more negative as the initial tax rate and the size of the change in the tax rate increase. …This evidence strongly supports distortionary and disincentive-based arguments regarding a nonlinear effect of tax rate changes on economic activity…the economy will inevitably suffer when taxes are increased at higher initial tax rate levels. What makes these finding especially powerful is that value-added taxes are less destructive than income taxes on a per-dollar-raised basis. So if taking a high VAT rate and making it even higher causes a disproportionate amount of economic damage, then imagine how destructive it is to increase top income tax rates. P.S. The fact that a VAT is less destructive than an income tax is definitely not an argument for enacting a VAT. That would be akin to arguing that it would be fun to break your wrist because that wouldn’t hurt as much as the broken leg you already have. I’ve even dealt with people who actually argue that a VAT isn’t economically destructive because it imposes the same tax on current consumption and future consumption. I agree with them that it is a good idea to avoid double taxation of saving and investment, but that doesn’t change the fact that a VAT increases the wedge between pre-tax income and post-tax consumption. And that means less incentive to earn income in the first place. Which is confirmed by the study. 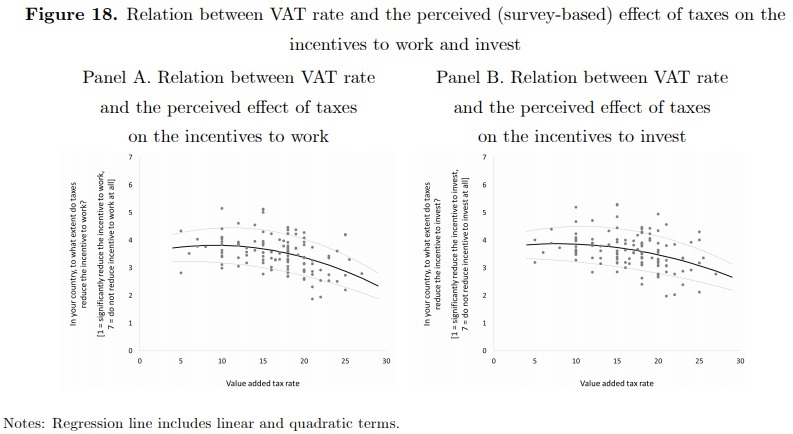 Panels A and B in Figure 18 show the relationship between the VAT rate a and the perceived effect of taxes on incentives to work and invest, respectively, for a sample of 123 countries for the year 2014. Supporting our previous findings, the relationship is highly non-linear. While the perceived effect of taxes on the incentives to work and invest barely changes as VAT rates increase at low/moderate levels (approximately until the VAT rate reaches 14 percent), it falls rapidly for high levels of VAT rates. Here’s the relevant chart from the report. The moral of the story is that all tax increases are misguided, but class-warfare taxes wreak the most economic havoc. P.S. Not everyone understands this common-sense observation. For instance, the bureaucrats at the Congressional Budget Office basically argued back in 2010 that a 100 percent tax rate was the way to maximize growth. When I write about the economics of fiscal policy and need to give people an easy-to-understand explanation on how government spending affects growth, I share my four-part video series. But. other than a much-too-short primer on growth and taxation from 2016, I don’t have something similar for tax policy. So I have to direct people to various columns about marginal tax rates, double taxation, tax favoritism, tax reform, corporate taxation, and tax competition. Today’s column isn’t going to be a comprehensive analysis of taxes and growth, but it is going to augment the 2016 primer by taking a close look at how some taxes are more destructive than others. And what makes today’s column noteworthy is that I’ll be citing the work of left-leaning international bureaucracies. Let’s look at a study from the OECD. …taxes…affect the decisions of households to save, supply labour and invest in human capital, the decisions of firms to produce, create jobs, invest and innovate, as well as the choice of savings channels and assets by investors. What matters for these decisions is not only the level of taxes but also the way in which different tax instruments are designed and combined to generate revenues…investigating how tax structures could best be designed to promote economic growth is a key issue for tax policy making. … this study looks at consequences of taxes for both GDP per capita levels and their transitional growth rates. For all intents and purposes, the economists at the OECD wanted to learn more about how taxes distort the quantity and quality of labor and capital, as illustrated by this flowchart from the report. Here are the main findings (some of which I cited, in an incidental fashion, back in 2014). Here’s how the study presented the findings. 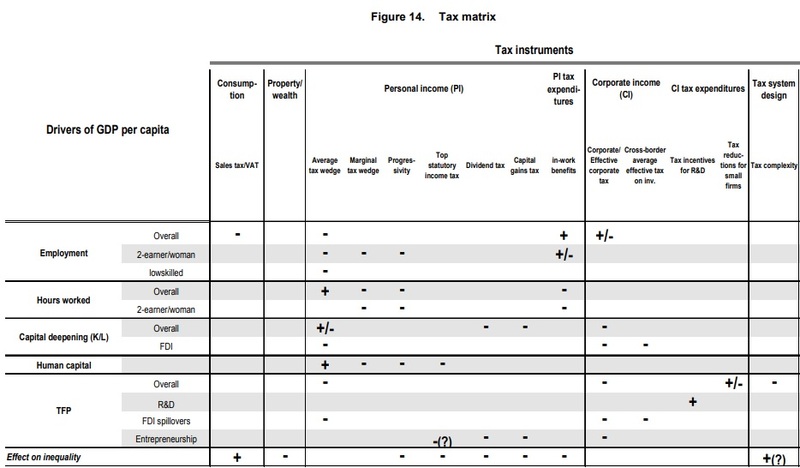 I might quibble with some of the conclusions, but it’s worth noting all the minuses in the columns for marginal tax, progressivity, top rates, dividends, capital gains, and corporate tax. This is all based on data from relatively prosperous countries. A new study from the International Monetary Fund, which looks at low-income nations rather than high-income nations, reaches the same conclusion. The average tax to GDP ratio in low-income countries is 15% compared to that of 30% in advanced economies. Meanwhile, these countries are also those that are in most need of fiscal space for sustainable and inclusive growth. In the past two decades, low-income countries have made substantial efforts in strengthening revenue mobilization. …what is the most desirable tax instrument for fiscal consolidation that balances the efficiency and equity concerns. In this paper, we study quantitatively the macroeconomic and distributional impacts of different tax instruments for low-income countries. But I assume some of that rhetoric was added at the direction of the political types. The economists who crunched the numbers produced results that confirm some of the essential principles of supply-side economics. …we conduct steady state comparison across revenue mobilization schemes where an additional tax revenues equal to 2% GDP in the benchmark economy are raised by VAT, PIT, and CIT respectively. 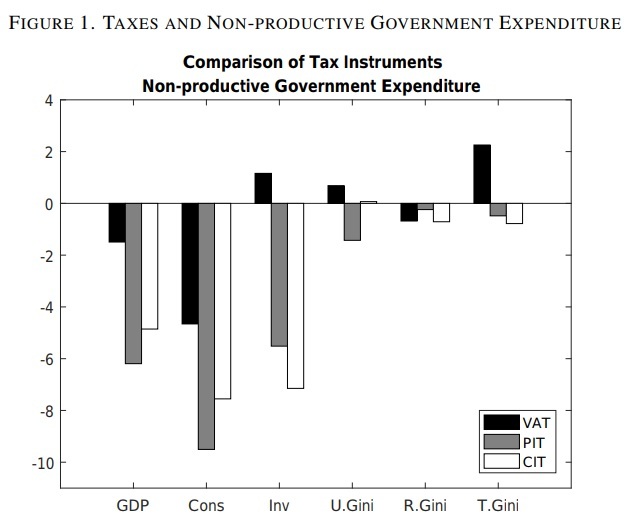 Our quantitative results show that across the three taxes, VAT leads to the least output and consumption losses of respectively 1.8% and 4% due to its non-distorting feature… Overall, we find that among the three taxes, VAT incurs the lowest efficiency costs in terms of aggregate output and consumption, but it could be very regressive… CIT, on the other hand, though causes larger efficiency costs, but has considerable better inequality implications. PIT, however, deteriorates both the economic efficiency and equity, thus is the most detrimental instrument. Here’s the most important chart from the study. It shows that all taxes undermine prosperity, but that personal income taxes (grey bar) and corporate income tax (white bar) do the most damage. I’ll close with two observations. First, these two studies are further confirmation of my observation that many – perhaps most – economists at international bureaucracies generate sensible analysis. They must be very frustrated that their advice is so frequently ignored by the political appointees who push for statist policies. Second, some well-meaning people look at this type of research and conclude that it would be okay if politicians in America imposed a value-added tax. They overlook that a VAT is bad for growth and are naive if they think a VAT somehow will lead to lower income tax burdens. 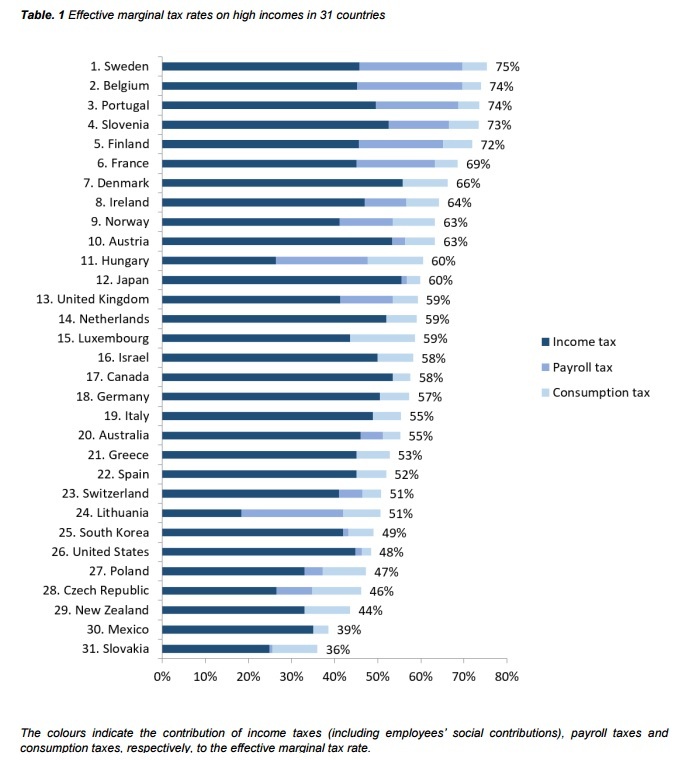 In the past few years, I’ve bolstered the case for lower tax rates by citing country-specific research from Italy, Australia, Germany, Sweden, Israel, Portugal, South Africa, the United States, Denmark, Russia, France, and the United Kingdom. Now let’s look to the north. Two Canadian scholars investigated the impact of provincial tax policy changes in Canada. Here are the issues they investigated. The tax cuts introduced by the provincial government of British Columbia (BC) in 2001 are an important example… The tax reform was introduced in two stages. In an attempt to make the BC’s economy more competitive, the government reduced the corporate income tax (CIT) rate initially by 3.0 percentage points with an additional 1.5 percentage point reduction in 2005. The government also cut the personal income tax (PIT) rate by about 25 percent. …The Canadian provincial governments’ tax policies provide a good natural experiment for the study of the effects of tax rates on growth. …The principal objective of this paper is to investigate the effects of taxation on growth using data from 10 Canadian provinces during 1977-2006. We also explore the relationship between tax rates and total tax revenue. We use the empirical results to assess the revenue and growth rate effects of the 2001 British Columbia’s incentive-based tax cuts. The results of this paper indicate that higher taxes are associated with lower private investment and slower economic growth. Our analysis suggests that a 10 percentage point cut in the statutory corporate income tax rate is associated with a temporary 1 to 2 percentage point increase in per capita GDP growth rate. Similarly, a 10 percentage point reduction in the top marginal personal income tax rate is related to a temporary one percentage point increase in the growth rate. … The results suggest that the tax cuts can result in significant long-run output gains. In particular, our simulation results indicate that the 4.5 percentage point CIT rate cut will boost the long-run GDP per capita in BC by 18 percent compared to the level that would have prevailed in the absence of the CIT tax cut. …The result indicates that a 10 percentage point reduction in the corporate marginal tax rate is associated with a 5.76 percentage point increase in the private investment to GDP ratio. Similarly, a 10 percentage point cut in the top personal income tax rate is related to a 5.96 percentage point rise in the private investment to GDP ratio. The authors look specifically at what happened when British Columbia adopted supply-side tax reforms. …In this section, we attempt to gauge the magnitude of the growth effects of the CIT and PIT rate cuts in BC in 2001… the growth rate effect of the tax cut is temporary, but long-lasting. 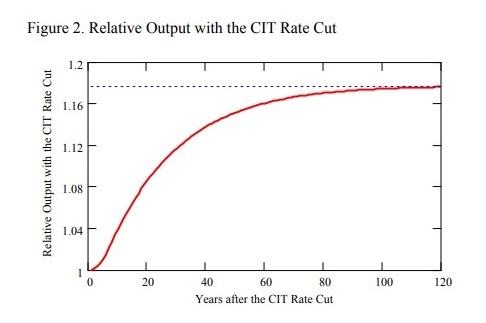 Figure 2 shows the output with the CIT rate cut relative to the no-tax cut output over the 120 years horizon. Our model indicates that in the long-run per capita output would be 17.6 percent higher with the 4.5 percentage point CIT rate cut. …We have used a similar procedure to calculate the effects of the five percentage point reduction in the PIT rate in BC. 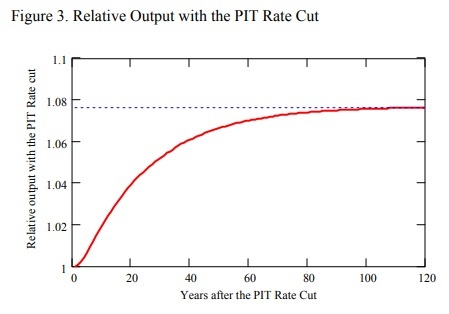 …The solid line in Figure 3 shows simulated relative output with the PIT rate cut compared to the output with the base line growth rate of 1.275. Our model indicates that per capita output would be 7.6 percent higher in the long run with the five percentage point PIT rate cut. Here’s their estimate of the long-run benefits of a lower corporate tax rate. And here’s what they found when estimating the pro-growth impact of a lower tax rate on households. In both cases, lower tax rates lead to more economic output. Which means that lower tax rates result in more taxable income (the core premise of the Laffer Curve). The amount of tax revenue that a provincial government collects depends on both its tax rates and tax bases. Thus one major concern that policy makers have in cutting tax rates is the implication of tax cuts for government tax receipts. 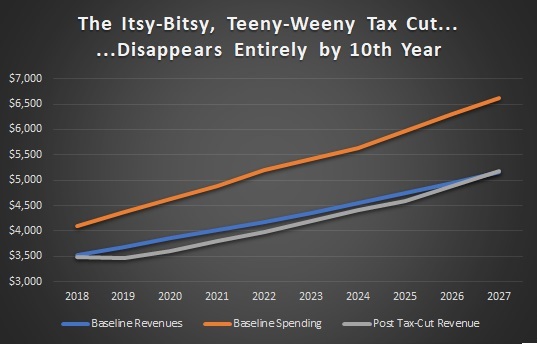 …The true cost of raising a tax rate to taxpayers is not just the direct cost of but also the loss of output caused by changes in taxpayers’ economic decisions. The Marginal Cost of Public Funds (MCF) measures the loss created by the additional distortion in the allocation of resources when an additional dollar of tax revenue is raised through a tax rate increase. …if…government is on the negatively-sloped section of its present value revenue Laffer curve…, a tax rate reduction would increase the present value of the government’s tax revenues. And the Canadian research determined that, measured by present value, the lower corporate tax rate will increase tax revenue. …computations indicate that including the growth rate effects substantially raises our view of the MCF for a PIT. Our computations therefore support previous analysis which indicates that it is much more costly to raise revenue through a PIT rate increase than through a sales tax rate increase and that there are potentially large efficiency gains if a province switches from an income tax to a sales tax. When the growth rate effects of the CIT are included in the analysis, …a CIT rate reduction would increase the present value of the government’s tax revenues. A CIT rate cut would make taxpayers better off and the government would have more funds to spend on public services or cut other taxes. Therefore our computations provide strong support for cutting corporate income tax rates. Needless to say, if faced with the choice between “more funds to spend” and “cut other taxes,” I greatly prefer the latter. Which is why I worry that people learn the wrong lesson when I point out that the rich paid a lot more tax after Reagan lowered the top rate in the 1980s. The goal is to generate more prosperity for people, not more revenue for government. So if a tax cut produces more revenue, the immediate response should be to drop the rate even further. But I’m digressing. The point of today’s column is simply to augment my collection of case studies showing that better tax policy produces better economic performance. P.S. The research from Canada also helps to explain the positive effect of decentralization and federalism. British Columbia had the leeway to adopt supply-side reforms because the central government in Canada is somewhat limited in size and scope. That’s even more true in Switzerland (where we see the best results), and somewhat true about the United States. 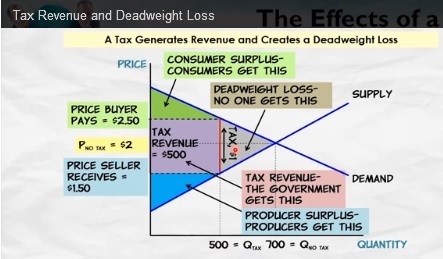 Three years ago, I shared two videos explaining taxation and deadweight loss (i.e., why high tax burdens are bad for prosperity). The “average tax rate” is the share of your income taken by government. If you earn $50,000 and your total tax bill is $10,000, then your average tax rate is 20 percent. The “marginal tax rate” is the amount of money the government takes if you earn more income. In other words, the additional amount government would take if your income rose from $50,000 to $51,000. These definitions are important because we want to contemplate why and how a tax cut helps an economy. But let’s start by explaining that a tax cut doesn’t boost growth because people have more money to spend. I want people to keep more of their earnings, to be sure, but that Keynesian-style explanation overlooks the fact that the additional “spending power” for taxpayers is offset when the government borrows more money to finance the tax cut. Instead, when thinking about taxes and prosperity, here are the three things you need to know. 1. Economic growth occurs when we increase the quantity and/or quality of labor and capital. 2. Taxes increase the cost of whatever is being taxed, and people respond by doing less of whatever is being taxed. 3. To get more prosperity, lower tax rates on productive behaviors such as work, saving, investment, and entrepreneurship. All this is completely correct, but there’s one additional point that needs to be stressed. 4. The tax rate that matters is the marginal tax rate, not the average tax rate. I discussed the importance of marginal tax rates in 2016, pointing out that Cam Newton of the Carolina Panthers was going to lose the Super Bowl (from a financial perspective) because the additional tax he was going to pay was going to exceed the additional income he would earn. In other words, his marginal tax rate was more than 100 percent. But I also included an example that’s more relevant to the rest of us, looking at our aforementioned hypothetical taxpayer with a 20 percent average tax rate on annual earnings of $50,000. I asked about incentives for this taxpayer to earn more money if the marginal tax rate on additional income was 0 percent, 20 percent, or 100 percent. Needless to say, as shown in this expanded illustration, the incentive to earn $51,000 will be nonexistent if all of the additional $1,000 goes to government. That’s why “supply-side economics” is focused on marginal tax rates. If we want more productive behavior, we want the lowest-possible marginal tax rates so people have the greatest-possible incentive to generate more prosperity. Here’s a very short video primer on this issue. One very important implication of this insight is that not all tax cuts (or tax increases) are created equal. 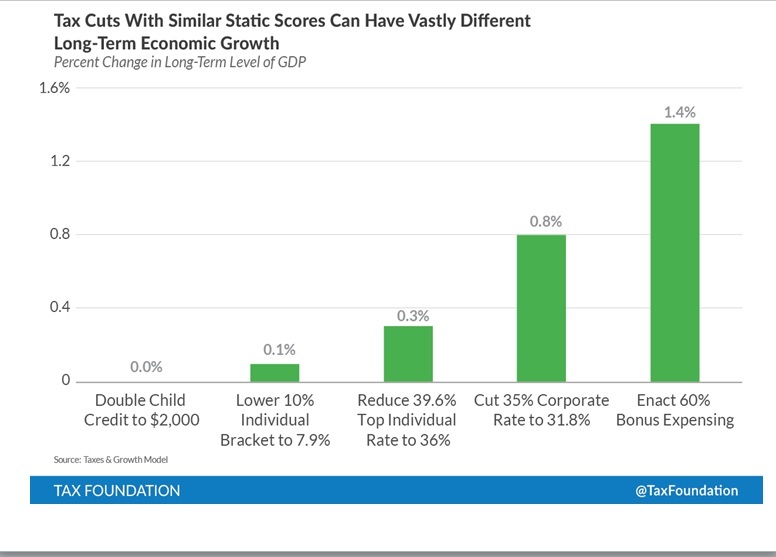 For instance, as I explained in a three-part series (here, here, and here), there will be very little change in incentives for productive activity if the government gives you a tax credit because you have kids. But if the government reduces the top tax rate or lowers the tax bias against saving and investment, the incentive for additional productive behavior will be significant. And this helps to explain why the country enjoyed such positive results from the supply-side changes to tax policy in the 1920s, 1960s, and 1980s. Let’s close with some good news (at least relatively speaking) for American readers. Compared to other industrialized countries, top marginal tax rates in the United States are not overly punitive. Admittedly, this is damning with faint praise. Our tax system is very unfriendly if you compare it to Monaco, Hong Kong, or Bermuda. But at least we’re not France, where there’s a strong argument to be made that the national sport is taxation rather than soccer. P.S. I’m not saying tax preferences for kids are wrong. But I am saying they’re not pro-growth. P.P.S. I mentioned above that Cam Newton – based on his personal finances – lost the Super Bowl even before the opening kickoff. Well, there’s scholarly evidence that teams in high-tax states actually win fewer games. P.P.P.S. Today’s analysis focuses on the individual income tax, but this analysis also applies to corporate taxation. A company with clever lawyers and accountants may have the ability to lower its average tax rate, but the marginal tax rate is what drives the incentive to earn more income. Which is why reducing the federal corporate rate from 35 percent to 21 percent was the best part of last year’s tax bill. Prosperity and Taxation: What Can We Learn from the 1920s? Last November, I wrote about the lessons we should learn from tax policy in the 1950s and concluded that very high tax rates impose a very high price. About six months before that, I shared lessons about tax policy in the 1980s and pointed out that Reaganomics was a recipe for prosperity. Now let’s take a look at another decade. Amity Shlaes, writing for the City Journal, discusses the battle between advocates of growth and the equality-über-alles crowd. …progressives have their metrics wrong and their story backward. The geeky Gini metric fails to capture the American economic dynamic: in our country, innovative bursts lead to great wealth, which then moves to the rest of the population. Equality campaigns don’t lead automatically to prosperity; instead, prosperity leads to a higher standard of living and, eventually, in democracies, to greater equality. The late Simon Kuznets, who posited that societies that grow economically eventually become more equal, was right: growth cannot be assumed. Prioritizing equality over markets and growth hurts markets and growth and, most important, the low earners for whom social-justice advocates claim to fight. Amity analyzes four important decades in the 20th century, including the 1930s, 1960s, and 1970s. Her entire article is worth reading, but I want to focus on what she wrote about the 1920s. Especially the part about tax policy. She starts with a description of the grim situation that President Harding and Vice President Coolidge inherited. …the early 1920s experienced a significant recession. At the end of World War I, the top income-tax rate stood at 77 percent. …in autumn 1920, two years after the armistice, the top rate was still high, at 73 percent. …The high tax rates, designed to corral the resources of the rich, failed to achieve their purpose. In 1916, 206 families or individuals filed returns reporting income of $1 million or more; the next year, 1917, when Wilson’s higher rates applied, only 141 families reported income of $1 million. By 1921, just 21 families reported to the Treasury that they had earned more than a million. Wow. Sort of the opposite of what happened in the 1980s, when lower rates resulted in more rich people and lots more taxable income. But I’m digressing. Let’s look at what happened starting in 1921. Against this tide, Harding and Coolidge made their choice: markets first. Harding tapped the toughest free marketeer on the public landscape, Mellon himself, to head the Treasury. …The Treasury secretary suggested…a lower rate, perhaps 25 percent, might foster more business activity, and so generate more revenue for federal coffers. …Harding and Mellon got the top rate down to 58 percent. When Harding died suddenly in 1923, Coolidge promised to “bend all my energies” to pushing taxes down further. …After winning election in his own right in 1924, Coolidge joined Mellon, and Congress, in yet another tax fight, eventually prevailing and cutting the top rate to the target 25 percent. And how did this work? …the tax cuts worked—the government did draw more revenue than predicted, as business, relieved, revived. The rich earned more than the rest—the Gini coefficient rose—but when it came to tax payments, something interesting happened. The Statistics of Income, the Treasury’s database, showed that the rich now paid a greater share of all taxes. Tax cuts for the rich made the rich pay taxes. To elaborate, let’s cite one of my favorite people. Here are a couple of charts from a study I wrote for the Heritage Foundation back in 1996. 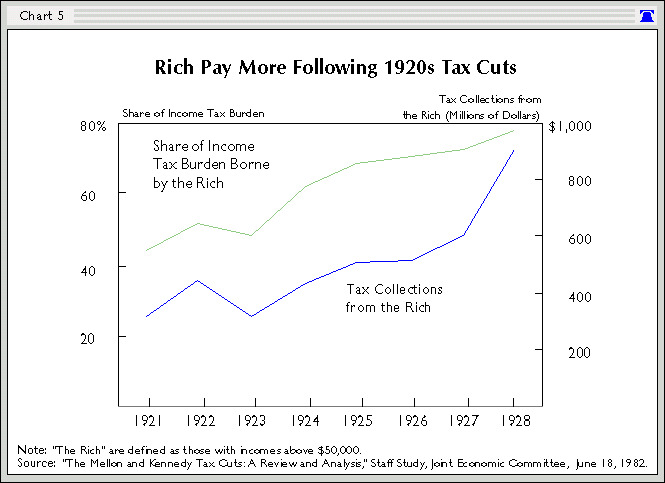 The first one shows that the rich sent more money to Washington when tax rates were reduced and also paid a larger share of the tax burden. And here’s a look at the second chart, which illustrates how overall revenues increased (red line) as the top tax rate fell (blue). So why did revenues climb after tax rates were reduced? Because the private economy prospered. Here are some excerpts about economic performance in the 1920s from a very thorough 1982 report from the Joint Economic Committee. Economic conditions rapidly improved after the act became law, lifting the United States out of the severe 1920-21 recession. Between 1921 and 1922, real GNP (measured in 1958 dollars) jumped 15.8 percent, from $127.8 billion to $148 billion, while personal savings rose from $1.59 billion to $5.40 -billion (from 2.6 percent to 8.9 percent of disposable personal income). Unemployment declined significantly, commerce and the construction industry boomed, and railroad traffic recovered. Stock prices and new issues increased, with prices up over 20 percent by year-end 1922.8 The Federal Reserve Board’s index of manufacturing production (series P-13-17) expanded 25 percent. …This trend was sustained through much of 1923, with a 12.1 percent boost in GNP to $165.9 billion. Personal savings increased to $7.7 billion (11 percent of disposable income)… Between 1924 ‘and 1925 real GNP grew 8.4 percent, from $165.5 billion to $179.4 billion. In this same period the amount of personal savings rose from an already impressive $6.77 billion to about $8.11 billion (from 9.5 percent to 11 percent of personal disposable income). The unemployment rated dropped 27.3 percents interest rates fell, and railroad traffic moved at near record levels. From June 1924 when the act became law to the end of that year the stock price index jumped almost 19 percent. This index increased another 23 percent between year-end 1924 and year-end 1925, while the amount of non-financial stock issues leapt 100 percent in the same period. …From 1925 to 1926 real GNP grew from $179.4 billion to $190 billion. The index of output per man-hour increased and the unemployment rate fell over 50 percent, from 4.0 percent to 1.9 percent. The Federal Reserve Board’s index of manufacturing production again rose, and stock prices of nonfinancial issues increased about 5 percent. I’ve pointed out many times that taxes are just one of many policies that impact economic performance. It’s quite likely that some of the good news in the 1920s was the result of other factors, such as spending discipline under both Harding and Coolidge. And it’s also possible that some of the growth was illusory since there was a bubble in the latter part of the decade. And everything went to hell in a hand basket, of course, once Hoover took over and radically expanded the size and scope of government. But all the caveats in the world don’t change the fact that Americans – both rich and poor – immensely benefited when punitive tax rates were slashed. P.S. Since Ms. Shlaes is Chairman of the Calvin Coolidge Presidential Foundation, I suggest you click here and here to learn more about the 20th century’s best or second-best President. P.P.S. I assume I don’t need to identify Coolidge’s rival for the top spot. Prosperity and Taxation: What Can We Learn from the 1950s? In my decades of trying to educate policy makers about the downsides of class-warfare tax policy, I periodically get hit with the argument that high tax rates don’t matter since America enjoyed a golden period of prosperity in the 1950s and early 1960s when the top tax rate was more than 90 percent. Here’s an example from Politico of what I’m talking about. Well into the 1950s, the top marginal tax rate was above 90%. …both real GDP and real per capita GDP were growing more than twice as fast in the 1950s as in the 2000s. This comparison grates on me in part because both Bush and Obama imposed bad policy, so it’s no surprise that the economy did not grow very fast when they were in office. But I also don’t like the comparison because the 1950s were not a halcyon era, as Brian Domitrovic explains. …you may be thinking, “But wait a minute. The 1950s, that was the greatest economic era ever. That’s when everybody had a job. Those jobs were for life. People got to live in suburbia and go on vacation and do all sorts of amazing things. It was post-war prosperity, right?” Actually, all of these things are myths. In the 1950s, the United States suffered four recessions. There was one in 1949, 1953, 1957, 1960 — four recessions in 11 years. The rate of structural unemployment kept going up, all the way up to 8% in the severe recession of 1957-58. …there wasn’t significant economic growth in the 1950s. It only averaged 2.5 percent during the presidency of Dwight D. Eisenhower. For today’s purposes, though, I want to focus solely on tax policy. And my leftist friends are correct that the United States had a punitive top tax rate in the 1950s. 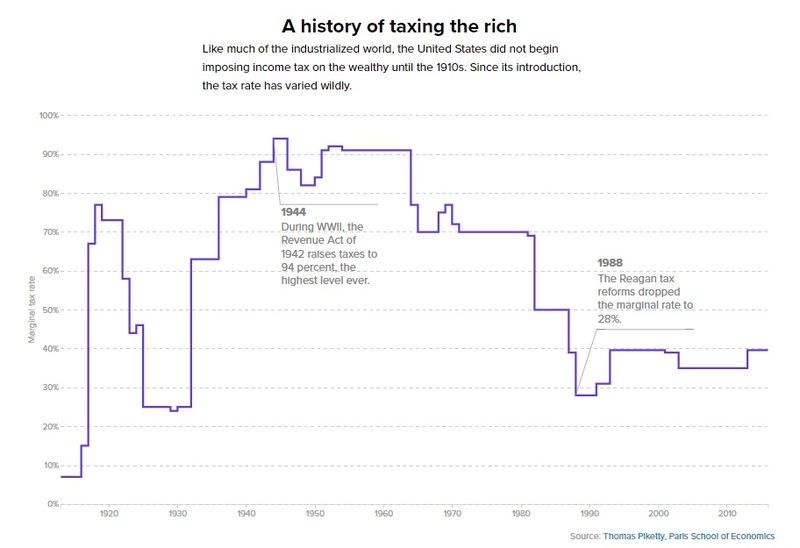 This chart from the Politico story shows the top tax rate beginning on that dark day in 1913 when the income tax was adopted. It started very low, then jumped dramatically during the horrible presidency of Woodrow Wilson, followed by a big reduction during the wonderful presidency of Calvin Coolidge. Then it jumped again during the awful presidencies of Herbert Hoover and Franklin Roosevelt. The rate stayed high in the 1950s before the Kennedy tax cuts and Reagan tax cuts, which were followed by some less dramatic changes under George H.W. Bush, Bill Clinton, George W. Bush, and Barack Obama. 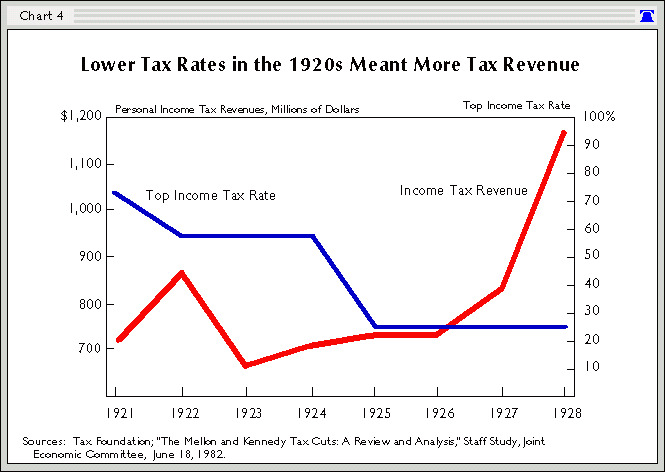 What do we know about the impact of the high tax rates put in place by Hoover and Roosevelt? We know the 1930s were an awful period for the economy, we know the 1940s were dominated by World War II, and we know the 1950s was a period of tepid growth. But we also know that high tax rates don’t result in high revenues. I don’t think Hauser’s Law always applies, but it’s definitely worked so far in the United States. This is because highly productive taxpayers have three ways to minimize and/or eliminate punitive taxes. First, they can simply choose to live a more relaxed life by reducing levels of work, saving, and investment. Second, they can engage in tax evasion. Third, they can practice tax avoidance, which is remarkably simple for people who have control over the timing, level, and composition of their income. All these factors mean that there’s not a linear relationship between tax rates and tax revenue (a.k.a., the Laffer Curve). And if you want some evidence on how high tax rates don’t work, Lawrence Lindsey, a former governor at the Federal Reserve, noted that extortionary tax rates are generally symbolic – at least from a revenue-raising perspective – since taxpayers will arrange their financial affairs to avoid the tax. …if you go back and look at the income tax data from 1960, as a place to start, the top rate was 91 percent. There were eight — eight Americans who paid the 91 percent tax rate. Interestingly, David Leonhardt of the New York Times inadvertently supported my argument in a recent column that was written to celebrate the era when tax rates were confiscatory. A half-century ago, a top automobile executive named George Romney — yes, Mitt’s father — turned down several big annual bonuses. He did so, he told his company’s board, because he believed that no executive should make more than $225,000 a year (which translates into almost $2 million today). …Romney didn’t try to make every dollar he could, or anywhere close to it. The same was true among many of his corporate peers. I gather the author wants us to think that the CEOs of the past were somehow better people than today’s versions. But it turns out that marginal tax rates played a big role in their decisions. By the way, Zucman is far from a supply-sider (indeed, he’s co-written with Piketty), yet he’s basically agreeing that marginal tax rates have a huge impact on incentives. The only difference between the two of us is that he thinks it is a good idea to discourage highly productive people from generating more income and I think it’s a bad idea. Meanwhile, Leonhardt also acknowledges the fundamental premise of supply-side economics. For more than 30 years now, the United States has lived with a top tax rate less than half as high as in George Romney’s day. And during those same three-plus decades, the pay of affluent Americans has soared. That’s not a coincidence. But he goes awry by then assuming (as is the case for many statists) the economy is a fixed pie. I’m not joking. Read for yourself. ..,the most powerful members of organizations have fought to keep more money for themselves. They have usually won that fight, which has left less money for everyone else. A market economy, however, is not a zero-sum game. It is possible for all income groups to become richer at the same time. That’s why lower tax rates are a good idea if we want more prosperity – keeping in mind the important caveat that taxation is just one of many policies that impact economic performance. P.S. Unbelievably, President Franklin Roosevelt actually tried to impose a 100 percent tax rate (and that’s not even the worst thing he advocated).